This post is sponsored by Ozery Bakery. While I received product and compensation, all opinions are my own. Thank you for supporting the companies that encourage my creativity and work. At my house, Christmas morning is the one morning out of the year that everyone is happy to wake up early. And every year, I think of new special recipes to make for my family that can be made ahead of time so they can bake while we sit back, savor another cup of coffee while the kids open presents. This year, my White Chocolate Cranberry Orange Bread Pudding Bites are making another debut. Yes, my friends, they are so delicious they are back by popular demand (from my kids). While I’ve made them quite a few times for dessert and they are always a winner, this holiday they’ll be making a special breakfast appearance. 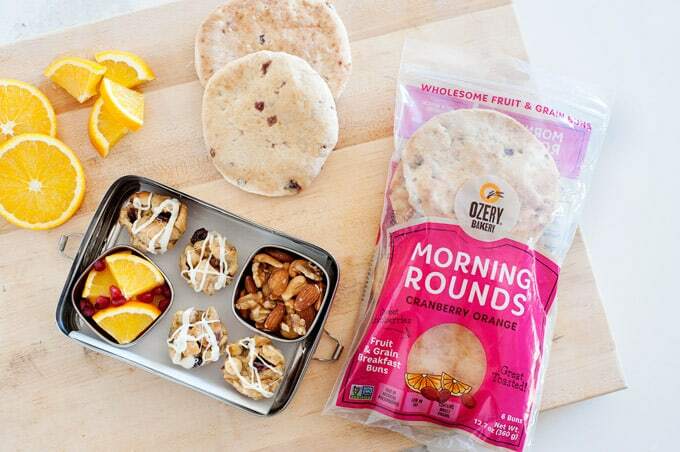 I first tried Ozery Bakery Morning Rounds this past summer when I started creating new recipes for MOMables’ school lunch plan. They are perfect for school lunches and snack time because they are made with whole grains and wholesome ingredients; and they are also available in a snacking size my kids love. Anything I made with them was an instant hit. From chicken salad sandwiches to grilled cheese rounds, the lunchboxes always came home empty. A win-win in my book! One Saturday morning I wanted to make bread pudding but had no bread in the pantry so I used the morning rounds instead. I decided to enhance their naturally delicious winning flavor combo of cranberry orange by adding a little fresh orange zest and a few more chopped up dried cranberries (those are optional, by the way, the rounds have enough but my family loves extra). The combination of light, fluffy bread pudding with bits of cranberries, fresh hints of orange, and a dreamy glaze of white chocolate (my kids’ suggestion) was one morning breakfast they’ve often asked for. What I love about this recipe is that it allows me to spend less time in the kitchen and more time with my kids on Christmas morning (or any weekend morning). I can make the mixture the night before, scoop it into a mini muffin pan, and refrigerate. In the morning, the oven preheats while the coffee is brewing and they bake while we open gifts. I love watching my kids’ big smiles and joyful squeals as they unwrap each gift. And with a recipe that I can prep-ahead like this one, it allows me to be 100% present where it matters. It really doesn’t get any better than this my friends. 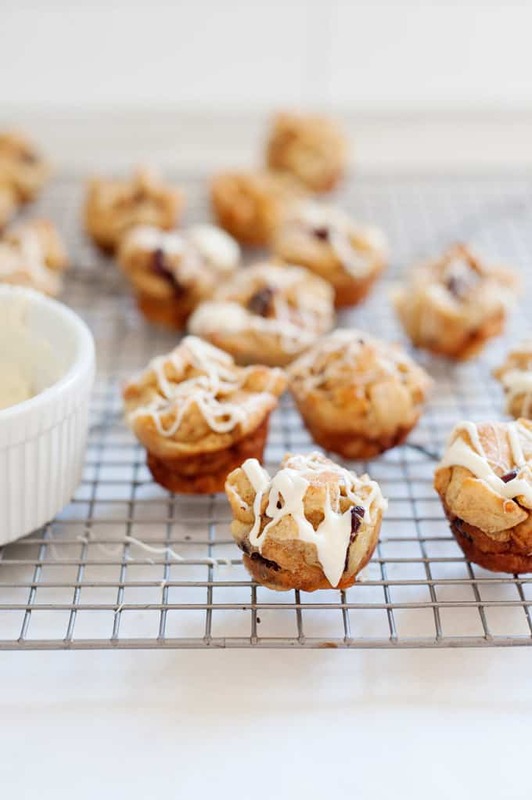 The aromas of freshly baked bread pudding bites will fill your house quickly! 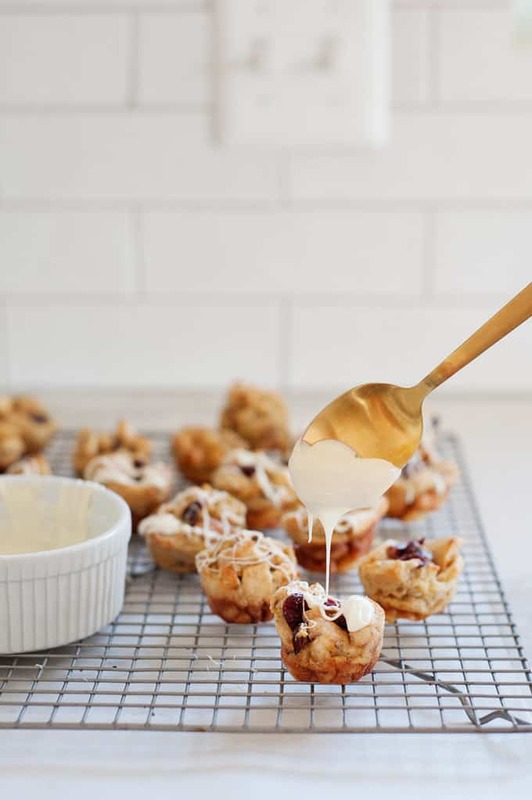 Once the mini bread puddings are finished, I’ll make a homemade white chocolate drizzle for the bites. Of course, the extra drizzle is optional and can be omitted, especially if you are not patient enough to keep a watchful eye on the white chocolate and stir it every 20 seconds to make sure it doesn’t burn if you use the microwave method (another reason I prefer the double boiler method). 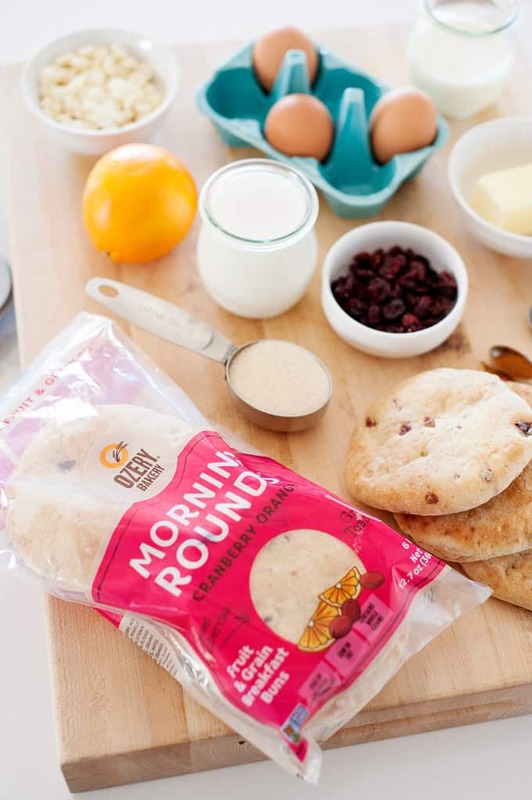 Who knew a snacking and lunchbox staple could make such a wonderful breakfast treat! Of course, they also work as perfectly portioned, festive dessert. If you are still here and your mouth isn’t watering yet, give these another look. From here, it looks like it’s going to be a very merry everything. Ozery is the better-for-you bread. Ozery is mostly available in Whole Foods, but also in a few specialty stores. To check the availability of Ozery products near you, check out their store locator. These Cranberry Orange Bread Pudding Bites are light and fluffy with bits of cranberries and hints of orange, all in one bite! Preheat the oven to 325, and grease a 24 mini muffin cup pan with butter or cooking spray. 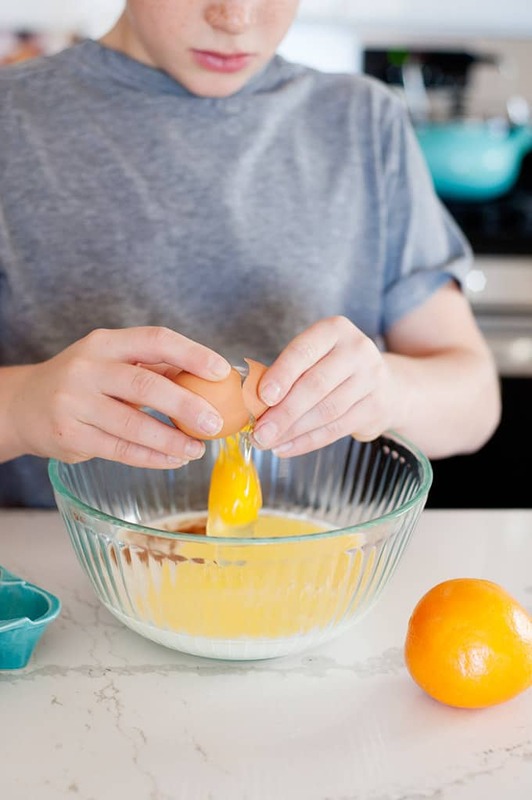 In a large bowl, add butter, milk, cream, sugar, nutmeg, vanilla extract, eggs, and orange zest and whisk to combine. Add cubed snacking rounds into the large bowl and toss around so that all cubes can absorb the liquid. Add dried cranberries and half of the chocolate chips. Toss mixture to combine ingredients. 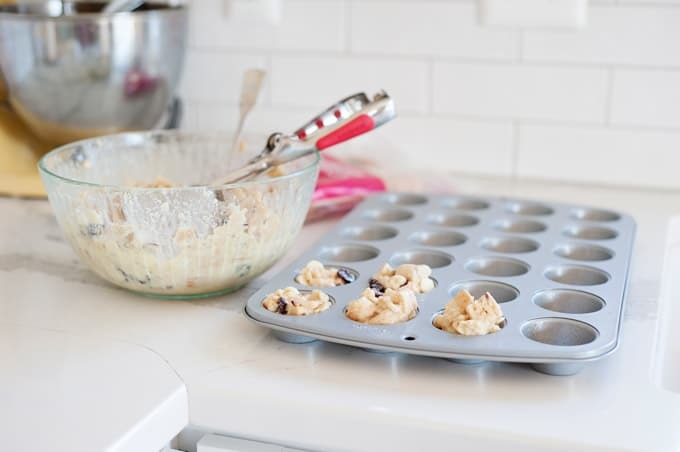 Using a cookie scooper, transfer mixture into greased mini muffin pan. Fill all cups generously, making sure all liquid is distributed evenly. Bake in the preheated oven for 17 minutes, until the tops are golden and the bread puddings are cooked through. Remove from oven. In a double boiler, add water at the bottom, place top broiler, and melt chocolate and coconut oil while stirring. Lightly drizzle over the top. Serve warm. Kitchen Notes: if using a microwave to melt chocolate chips, carefully stirring every 20 seconds to make sure chocolate doesn’t burn. 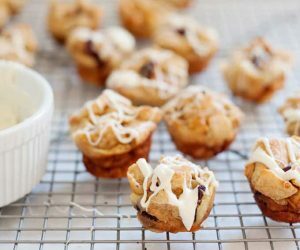 White chocolate isn’t as forgiving as traditional semi-sweet chocolate chips. I used the morning rounds for this recipe but the snacking rounds will work great for this recipe as well. I found these at my local Whole Foods, in case anyone is wondering. They were good. I gave them a test run without the drizzle. 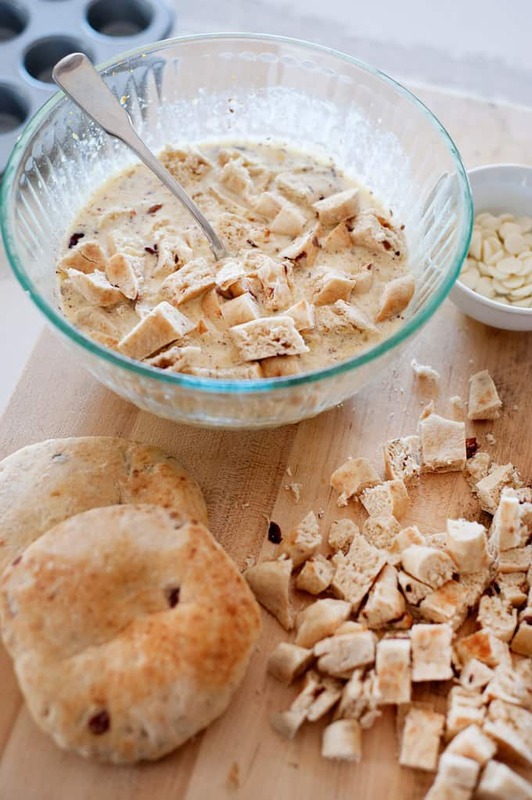 I might be making these for Christmas day… great recipe! Looking forward to trying these! We have a coconut allergy at my house. What is the best alternative oil for melting with the white chocolate for the glaze? Hi Erin, you can omit the coconut oil. It just smooths it out a little more. Using the double broiler method will work best since white chocolate tends to burn quickly. You’ll be fine without it. Enjoy!